Our next meeting is coming up on January 29th, 7:00pm at UAT in the Theatre. Tyler is currently the CEO and Creative Director of Retora Game Studios, an independent game studio in Phoenix, Arizona. He is also one of the directors for the Future Is Games conference. 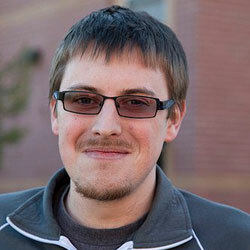 In the past year, he has worked on multiple titles, with multiple mobile releases. He is currently developing mobile and social apps for third party clientele. While active in the local developer community, his passions include procedural generation, Lua, rapid prototyping, game education, and simulation games. Procedural content generation (PCG) is the programmatic generation of game content using a random or pseudo-random process that results in an unpredictable range of possible game play spaces. In this session, Tyler will cover the basics of procedural generation, and the why, where, and when of its use. Examples of games with and without procedural content will be used, showing the ramifications of changing the content generation in those titles. This will cover why procedural generation should be used, when it should be used, and where it should be considered. There will also be suggestions on specific solutions and how some games could have received benefit from the procedural creation of content. One of the two locations for Global Game Jam in Phoenix is the University of Advancing Technology. The event begins at 5:00pm on January 24th and goes until the night of January 26th. You can register for the jam location and find out more details here. Global Game Jam is also being hosted by Game CoLab at Arizona State University. The event begins at 2:00pm on January 24th and goes until the night of January 26th. You can register for the jam location and find out more details here. If you’re an IGDA Member planning on attending GDC this year, you can save money on buying your conference pass with an IGDA Member Discount. Check out all the details here.